Power and Precision: Smart and Safe Weed Control In Your Hands! It Works! Sold Exclusively at your Nearest Web Browser! Identify and Defy Invasive Weeds! - Mobile Device View for Weed ID! This IS the Magic Wand of Weeding! Drill Powered Tool! WEED TWISTER Strong and Deft Weed Deterrence - Muscles Optional - Chemicals Obsolete! 1. 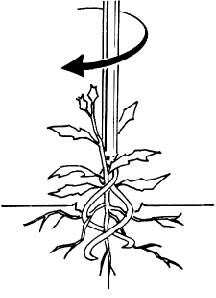 Point the coil towards the center of the root. For low profile weeds, such as dandelions, place coil directly atop plant. Approach larger or more distant weeds at an angle. The 36" length allows you to reach weeds 3 feet or more away from your path. 2. Twist the coils into the soil applying pressure as needed. Moisten soil if dry before applying tool. 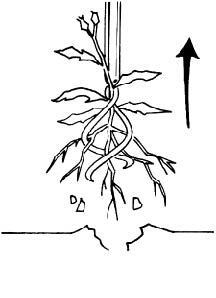 You can easily penetrate soil as deep as 6" or more just by twisting. The 2" diameter coil makes a hole hardly noticeable in most lawns. No twisting needed when used as a circle hoe for small seedling weeds. 3. 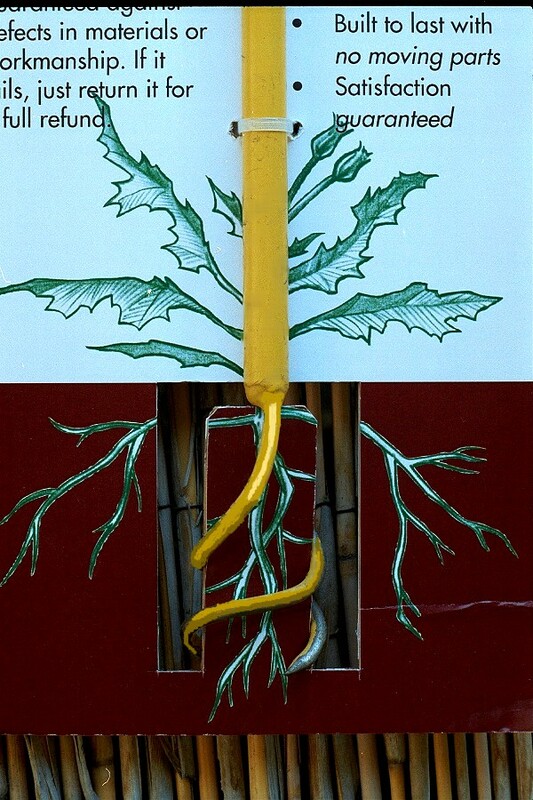 Lift the WEED TWISTER� when roots are loosened. When you see the plant doing the "Twist" dance with the tool, you know it's ready to go! Just tap the spring steel coils against any hard object to quickly remove the plug of dirt that may accompany the roots. Little or no pickup of debris is necessary. 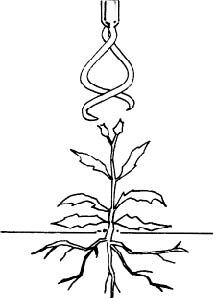 WEED with it: Twist it into roots of larger weeds or hoe smaller weed seedlings like using a circle hoe. The versatile WEED TWISTER can defend your garden against the smallest of weeds in narrow spaces and much larger weeds with roots from 6" to 12" deep. Reach under brush as far as 3 feet or more away from your path without having to use your foot to push the tool as required by some other tools and twisters. See the Quick Tips page for detailed instructions. WORK with it: Dig holes for planting. Pick up debris, papers, leaves by puncturing or hooking the coils around the articles. Make narrow furrows for planting or cultivation by dragging coils across the soil. Even with one hand from a wheel chair, you can dig small holes, remove debris, and take out weeds with this handy tool. With a little practice, you can become a Master Weed Twister. WALK with it: Don't enter your garden without it! Keep it handy, by your back door or garden entrance. Its 36" length and light weight of only one pound make the WEED TWISTER a comfortable walking stick and companion every time you walk into your garden, or any hiking path, even it you don't expect to see any weeds. And if a weed happens to show up, your trusty weed defense tool is right in your hand and ready to go to work for you! It can also help to defend you against snakes, rodents, wild dogs or felines and other smaller critters like spiders or insects that happen to cross your path. For "how to" information and more interesting applications for the WEED TWISTER see the Quick Tips page. WHIRL AWAY YOUR WEEDS with it: Now faster than ever using your drill to twist out weeds by the root at lightning speed! Get down to the nitty gritty to rip out roots left behind by knives, fingers, wackers and most other weed pullers and hoes. For speed and ease the answer is the Turbo Weed Twister. Can it pull out weeds with roots as deep as 6 to 12 inches or greater? Can it twist out networked grasses, vines and prostrate stems? Can it also work like a precise hoe against new seedlings? Is it a good match against all my most troublesome weeds? Can it help to reduce my dependence on herbicides? Is it strong but light weight and easy to carry around? Does it have a long handle, as long as 36-60 inches? Can I use my drill to replace manual twisting on some models? Can my drill-powered tool also be used manually? If the answer to ALL these questions is YES, Buy It! 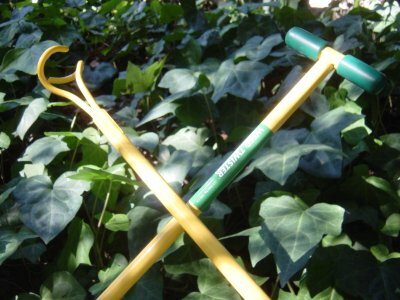 See a Big Collection of Unique Garden Weeding Tools by Ergonica! Unlike many other weed pullers and poppers that require pushing a lever with your foot, for example, the Ergonica Weed Twister can be used to remove weeds by their roots (as deep as 12 inches or more) located a considerable distance from your path. Great for pulling weeds under brush or close to thorny cactus plants and brambles, as well as poison ivy and other toxic plants. No foot levers or hinged tines that often break loose with repeated use! Use the Drill-Ready TurboTorx models to efficiently attack patches of unwanted Bermuda Grass, Crabgrass and other grassy weeds or vines with prostrate stems. Which Ergonica Weed Twister Models are Best For You? One Size Fits All? Do you have weeds in places that are hard to reach? Are you uncomfortable when stooping down to remove weeds? Ergonica offers several models with different lengths (from 36 to 60 inches) and handle options, including popular drill-ready models, to solve your various weeding problems efficiently and safely. Refer to the Recommended Ergonica Weed Twister Tools Chart at left for practical and ergonomic considerations and use the Price Range Selection Tool below for economic values... making it easier for you to decide on the best values for one or more tools that really work for YOU (YOUR TEAM) AND YOUR WEEDS in various locations and circumstances! Note: Purchasing more than one tool in the same order can save on shipping costs per item. A good way to keep your family team / crew busy and productive during the spring and summer seasons! purslane, tree of heaven and mallow. Identify your weeds with pictures in Your State or Region. Learn about growing Legal Marijuana-Cannabis Weed. More information about the patented WEED TWISTER and how it will change your life in the garden! Pricing, Models and Discount Offers! Copyright � 1999-2017 Ergonica. All rights reserved.